We could all use some help in our fridge sometimes. Let's face it, unless you're an obsessive refrigerator cleaner, you'll get those smells at some point or another - that delicious but funky cheese, the bacon you're saving for a BLT, the half onion, or (Bill's favorite) fish. Bill is happy to lend a hand - er, flipper...whatever. Your sentinel standing guard against smell. Hey, Bill's a penguin, he loves the cold! So let Bill relax in his natural chilly environment and soak up stray smells. 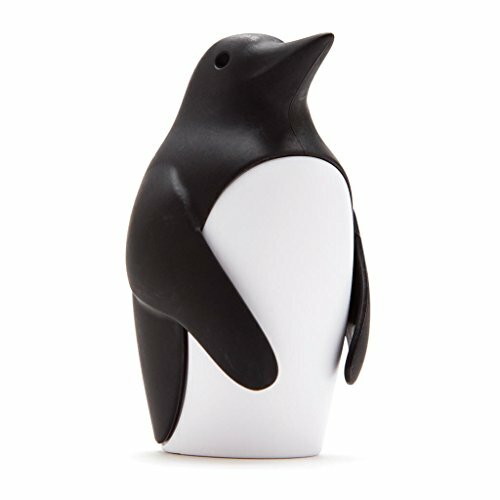 He'll happily live in the door or a corner of your fridge or freezer, keeping odor at bay. Endlessly reusable, inexpensive and completely safe around kids or animals. Simply fill Bill's belly with baking soda. No need to find plastic, one-use filters or buy expensive systems. Chances are you've got the solution to your refrigerator odor already right in your kitchen. Buy Bill today and add whimsical practicality, not to mention savings, to your refrigerator's life. Think Outside The Box: You could plop a box of baking soda into your fridge, or how about smiling every time you open it?